A party wall, rising along the side of its neighboring building, is all that remains of 85 Franklin Street’s upper three stories. They have been missing since 1936, the year that the owner lopped them off and gave a stylish, Art Moderne façade to the bottom two floors that remain. As part of a plan to develop 85 Franklin Street into a new residential building, architect Markus Dochantschi proposes to bring the structure, built in 1862 for textile wholesaling and manufacturing, back to its original height. But that’s where the similarity to what once was a brick-and-stone building, typical of its neighbors, will end. “Being an architect and intrigued by the building we asked ourselves what would be the right architectural step to deal with what is now a street gap that had been built to the cornice height of the neighboring buildings,” said Dochantschi of MDA Architects. 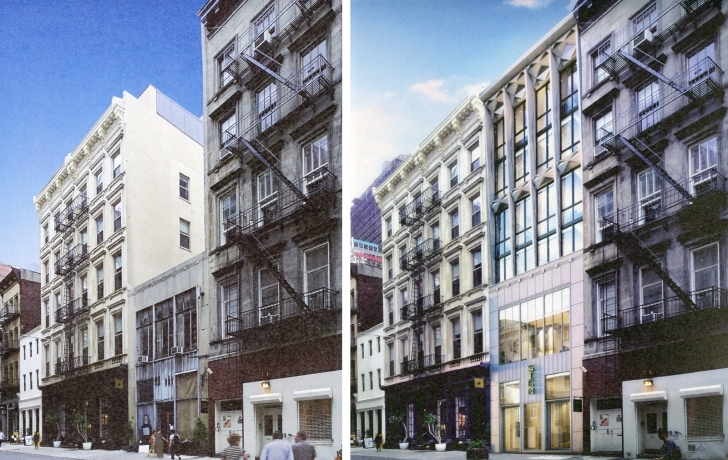 In advance of bringing the plan before the Landmarks Preservation Commission next month, Dochantschi showed his design to Community Board 1’s Landmarks Committee last week for advisory approval. A penthouse, clad in metal paneling, would be set back 20 feet from the cornice and not visible from the street, Dochantschi said. At street level, what now are storefront windows left and right, with a door in the middle, will be reversed. The plan calls for a store window in the center flanked by a store entrance on one side and residential entrance on the other. The building is slated to house four apartments, some full floors, others half floor duplexes. The current two-story façade has the distinction of being designed by Thomas W. Lamb, best known as the architect of vaudeville and movie theaters in the 1910s and 20s, and partner in the design of Broadway’s Ziegfeld Theatre (1927-1966). The committee withheld its approval until seeing examples of the materials, which they are expected to examine before CB1’s full board meeting on Nov. 27. Nevertheless, they praised the design, and the decision to work with the existing structure. “They could have come in and knocked it down,” said committee member Susan Cole. Roger Byron, the chair, agreed. “Most often they do,” he said. The Landmarks Preservation Commission is expected to consider the plan on Dec. 17.